In many respects, the Social Media Marketing/Brand Marketing Department of the FSC campus is the lifeblood of the university. It provides a wealth of invaluable information about the FSC identity and the students/faculty/staff that work here. The Social Media Marketing Department’s services are fairly straightforward. We basically deal in avenues of advertising and information. The Marketing and Advertising Department is basically the nucleus for college enrollment and branding specialties. Think of this particular piece of the FSC family as a highway where all other vehicles can get from one destination to another. 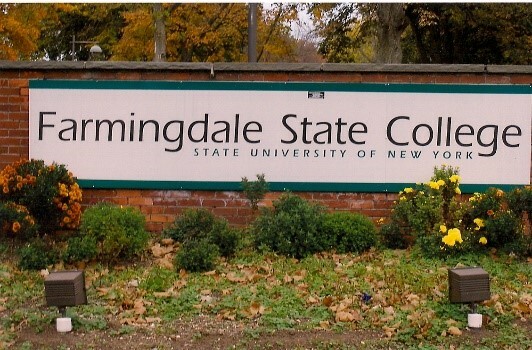 The Marketing/Advertising/Branding Department works closely with Professional Communications specialists like photographers, advertisers, reporters, strategists and more, to sell Farmingdale State College on a grand scale. The services include providing around-the-clock coverage of live updates like weather, campus news, athletics and emergencies. From that strand of information, there comes a strategy of how to present it. Photographers and Photoshop analysts have to find the right inviting image. The Communications people have to write a simple yet informative piece. It is very much a team effort. As far as the social media aspect is concerned, each of the six or seven interns under the direction of the campus Brand Strategist is given dominion over various platforms. Facebook, Instagram, Twitter, Snap Chat, Pinterest, LinkedIn and more are all used as strands of information and advertising for the FSC body. I, a PCM student, might monitor Facebook while another, a Business student, might tackle LinkedIn. As interns we are required to digest information from Campus Times, creative professionals and brand strategists, and convert this information into posts. For example, if the president of the campus is having a dinner in three days and is inviting all students and faculty, it is my job to get the word out on my platform. Other services of Social Media Marketing include providing mentorships and guidelines on how to improve. We are provided regular lectures on Photography, Photoshop, Marketing and Strategy. The department’s Brand Strategist has mandatory weekly meetings so we’re all on the same page creatively and intellectually. We’re all in constant discussion on the app GroupMe. In many ways, the flow of information never stops. The services performed by the Marketing Department boil down to making the FSC experience more immersive and interactive. The main notion we work against is that FSC is a commuter school. Their services are to provide information on clubs, events, career opportunities, parties, gatherings, games, and bring the amazing experiences on campus into the limelight. The Farmingdale State College experience and the Social Media Marketing internship on campus have similarities and differences. The main similarity, of course, is that they are both on campus. I go to classes each day and keep up with the work, and I do the exact same with the internship experience. On Tuesdays and Thursday, I have classes from 8:50 p.m. to 3 p.m. and in between those classes I have a weekly meeting. Both experiences require a tremendous amount of work and dedication. They also share a contribution to my eventual entry-level job and inevitable career. These experiences share a through line of Professional Communications; knowing who your audience is and what your goal is about are essential in delivering any sort of information. That basic framework is paramount to both experiences. My college and internship workplace experiences align in exactly that: experience. Both provide a wide array of experience to aid me in my future endeavors. Both require a great deal of professionalism, attendance and responsibility. And lastly, both require me to remain vigilant in the face of education and absorb as much as I can to gain new skills and acquire new perspectives. My college experience is pretty straightforward. I go to class, remain a participant in respective studies, do the work and make sure I’ve completed tests and projects to the best of my ability. My internship experiences, however, are more of a fluid work ethic. There are times when I’m working from home or from the campus. The Brand Strategist responsible for the Social Media Marketing Department isn’t strict or unreasonable, but firm. There are deadlines every Thursday and mandatory meetings. With the internship, there is more supervision, various tasks and relationships. As opposed to class where most things are cut-and-dry, the internship experience is more of a personalized nature. My relationship with my fellow interns is for the benefit of the both of us, while my relationship with my professors is for the benefit of myself.